MELISMATIC: Kylie's An 'Aphrodite', Alright? You probably could have guessed this was coming. In terms of official fandom, this year's Aphrodite marks the first actual Kylie Minogue release that I've looked forward to as a true blue fan. I've been an admirer for years, especially after I heard "Spinning Around" and "Can't Get You Out of My Head". I was hardly what you call a super-fan, and I'm not so quick to assert myself as such even now. With that said, Kylie knows what works for her -- she has a formula that could be labeled as a bit repetitive at times, but what she does always fits her like a glove. As they say, if it ain't broke, don't fix it. 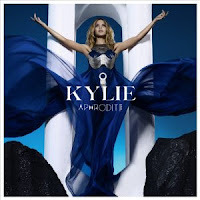 Kylie was never the musician with the biggest vocal capacity -- she was the diva with the slickest disco beats, and that tradition continues in sharp definition and form on Aphrodite. There is no questioning this. It should just be accepted as such. Aphrodite isn't the best album beginning to end I've heard this year, but it's certainly among a respectable list that's been bubbling up in this little head of mine over the past six months (see the recently addended The Year 2010: Part 1 post). First single "All The Lovers", although not one of my plumb picks when I first heard it, has grown on my ears substantially. If it resonates with you, and you've yet to hear the entire album, I suggest you are in for a doozy because the best is yet to come. If you feel you could take it or leave it, as I felt initially, please accept my humble notation that "Lovers" is a mere tip of the iceberg in terms of what's waiting in store. I still don't feel its the strongest song on the set -- that kudo goes to "Get Outta My Way," the second single, a sugary little nugget of classic Minogue that relies less on hazy synth as "Lovers" does and is much more dance-floor friendly. "Outta My Way" indeed. In my ears, the strength (and heart) of Aphrodite lies in its first half (Tracks 1-6). "Put Your Hands Up (If You Feel Love)" is a dancefloor anthem if I ever heard one, and is begging to be remixed up with some harder beats for the clubs. It was also co-produced by Starsmith, who were behind much of Ellie Goulding and Diana Vickers recent albums. "Closer" positively pulsates with robotic, assembly-line synth. My personal favorite of the whole set is the title track. This Nerina Pallot co-write is what I was most looking forward to from the entire project, and it doesn't dissapoint for one second. From the tinny beats, to the "Can you feel me on your stereo?" sass, to that triumphant chorus -- all exemplifies to me what Kylie inherently represents to the people she inspires. She's strong. She's confident. She's an Aphrodite, alright? Does it get more anthematic than that? The chorus itself may just be my new personal mantra. You don't wanna fight me, alright? It's not to say the rest of the record isn't a must-listen. Calvin Harris and Jake Shears (of the Scissor Sisters -- another must listen album is their recent Night Work!) co-write "Too Much" is a fun little club ditty that screams Kylie summer fun. "Cupid Boy" is a cut that is also getting a lot of attention from the bloggers and tastemakers. It's opening guitar monotone reminds me a bit of Kelly Clarkson's "Since U Been Gone" before drifting in a Minogue Dreamland that really seems to set the mood of the entire album. Overall, not unlike Goldfrapp's Head First, Aphrodite positively resonates with summery glitter that provides a great backdrop for car rides with friends, trips to the beach, BBQs with the fam, you name it. Kylie in this top notch form is good anytime of the year, but in summer time (especially in unbearably hot NYC), its practically kismet. "Aphrodite" is, at the halfway point of the year, my #2 song, only surpassed by Bright Light Bright Light's "A New Word To Say". Epic is not an exaggeration, and I have no clue why. I'm with Paul - I've been a Kylie fan for AGES - and the album is just PURE BRILLIANCE!! !